Hyperthyroidism is the term used for an over active thyroid, which speeds up your bodies metabolism. While both men and women can suffer from this disorder, women are more commonly affected. The condition is most often diagnosed with a blood test that measures the amount of TSH (Thyroid Stimulating Hormone), T3 (active thyroid hormone) and T4 (inactive thyroid hormone) in your body. When your TSH is low and your T3 and T4 are high, you will be diagnosed with hyperthyroidism. Most physicians treat the condition with radioactive iodine or anti-thyroid medications. Anti-thyroid medication can relieve symptoms by reducing the production of thyroid hormone. However, the medication does not correct the dysfunction of your thyroid gland. On the other hand, radioactive iodine, damages or kills the cells of your thyroid so that they no longer produce hormone. Because radioactive iodine severely damages your thyroid gland it can cause hypothyroidism (under active thyroid) creating a lifelong dependence on thyroid medication. Untreated, a hyperthyroid state can cause serious health problems weakening your heart, leaching calcium from your bones and damaging cells in your body. Alongside holistic support, severe cases normally require one of these more aggressive treatment methods. Unfortunately, neither of these options address the root cause of your condition. In mild to moderate cases, you can control and sometimes correct your condition with diet and lifestyle changes avoiding the side effects of the more extreme treatments. Some people with hyperthyroidism do well with herbal medicinals. In traditional Chinese medicine, we use herbs to strengthen weaknesses, clear toxicity and support your liver. 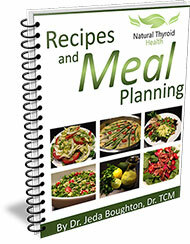 They can help nourish your endocrine glands and balance your immune system to address the root cause of your illness. It can take years to develop hyperthyroidism and months to experience the benefits of natural treatments. Both genetics and lifestyle factors play a role in the onset of hyperthyroidism. Stress, smoking and caffeine are known triggers for hyperthyroidism and its symptoms. You can control inflammation by avoiding these as well as limiting sugar and processed foods. Environmental toxins can also weaken your hormone system. There are some easy ways to clean up the air you breath such as avoiding chemical cleaners, colognes and personal care products that contain endocrine disruptors. Whether or not you are able to control the symptoms of hyperthyroidism without having to resort to drastic medical treatments, you will want to address lifestyle factors that will help you recover. Always have your experienced physician oversee any type of treatment you decide to try.